"A nice, light no-bake dessert that's a cross between cake and pudding! Easy and delicious! I made mine low-fat by using low-fat cream cheese and lite whipped topping." In a saucepan, combine cherries, sugar and flour. Bring to a boil over medium-high heat, stirring constantly. Continue to boil for 5 minutes. Remove from heat and set aside to cool. In a large bowl, beat cream cheese and vanilla until smooth. fold in whipped topping. Pour half of the cream cheese mixture into a 9x12 inch glass dish. Crumble the angel food cake and sprinkle evenly over the top of cream cheese mixture in dish. Spread remaining cream cheese mixture over cake. 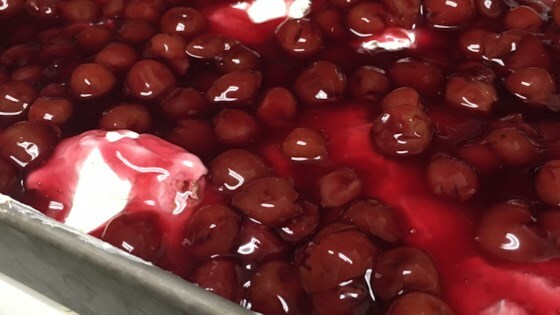 Cover top with cherry mixture. Refrigerate for at least 5 hours. Is a beautiful holiday presentation in a truffle bowl. I made this one diabetic style, even using "no sugar added" pie filling. It was great. Great recipe - light and lots of flavor. The fat free cream cheese and cool whip works great too. This was such a hit. Both a pretty AND tasty dessert.